Let’s change track now, to a topical venue. With the coming of Christmas, this little part of the world is the focus of millions of people around our shrinking globe. I went there in 2010, a place I’d always wanted to visit. 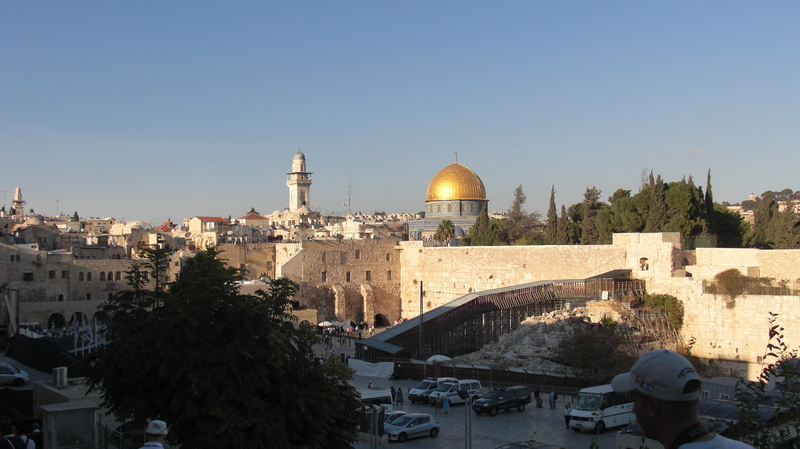 And when I finally came to Jerusalem I was astounded, shocked, bewildered. 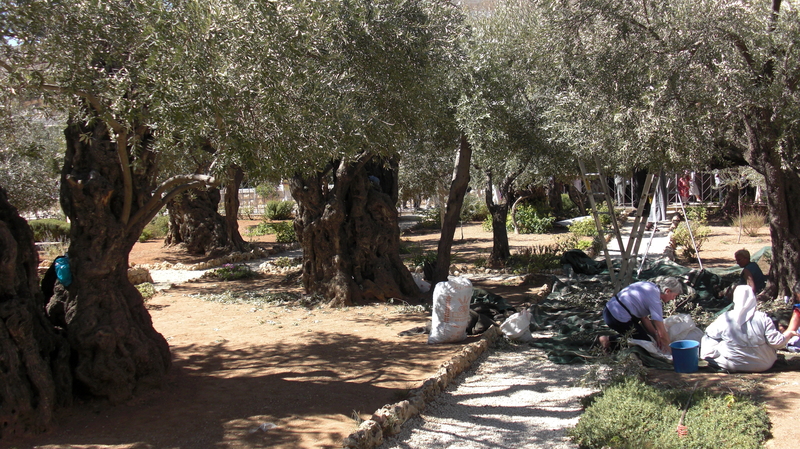 The Garden of Gethsemane is tiny. Inside, a group of people pick and grade the olives. I wander beside the Garden, marvelling at the ancient twisted olive trees, wondering at the smallness of it, picturing Jesus in his agony. Where was it that he left his disciples to “watch and pray”? Where did he ask for the cup to be taken from him? 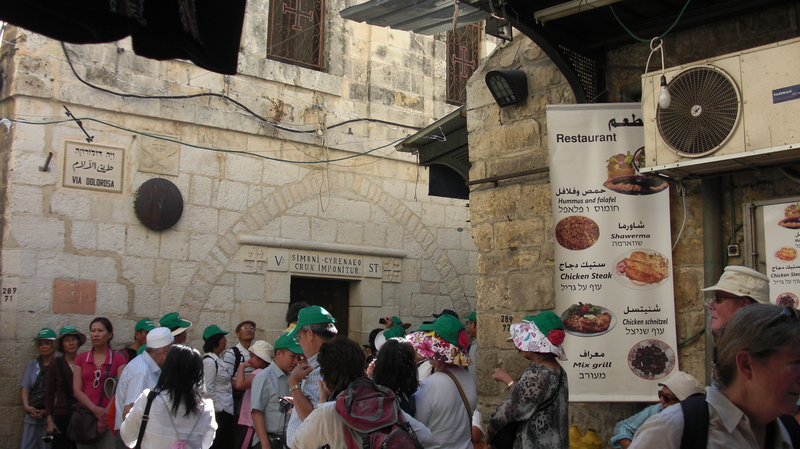 Chapels of many differing denominations line the Via Dolorosa; the devout try to pray in the melee; some groups wearing green caps stand out. It becomes more and more crowded, diverse and commercial as we progress, probably, rather like it was in Jesus’ time; a medley of nations and faiths. Vibrant traders are at every turn, selling imaginative trinkets. Prices are exorbitant. 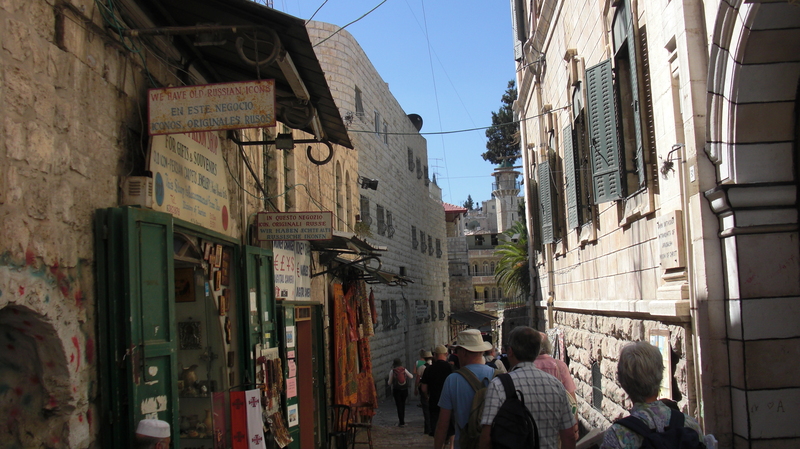 Then we arrive in the Christian quarter. Blessed peace and quiet. An Ethiopian monk emerges from a rounded clay dwelling and pads by. We pause to savour the intricate decorations in a tiny Coptic church, passing a mute invitation for offerings, before descending some steps, which bring us back into the cacophony of commercial Christianity. 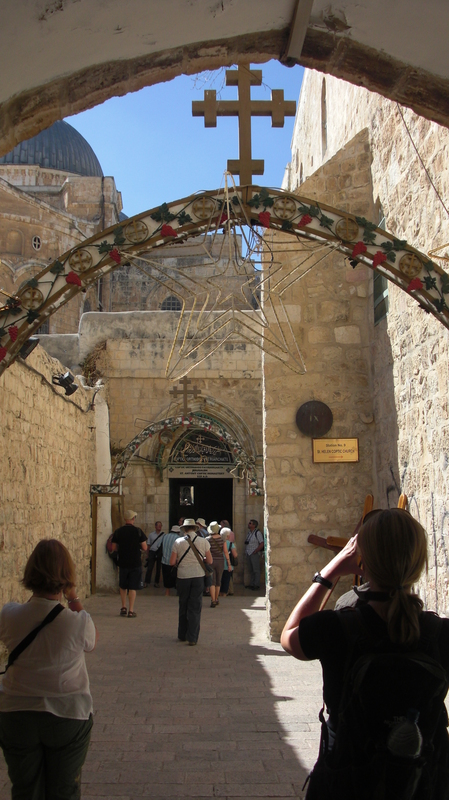 The square of the Church of the Holy Sepulchre. Jerusalem. 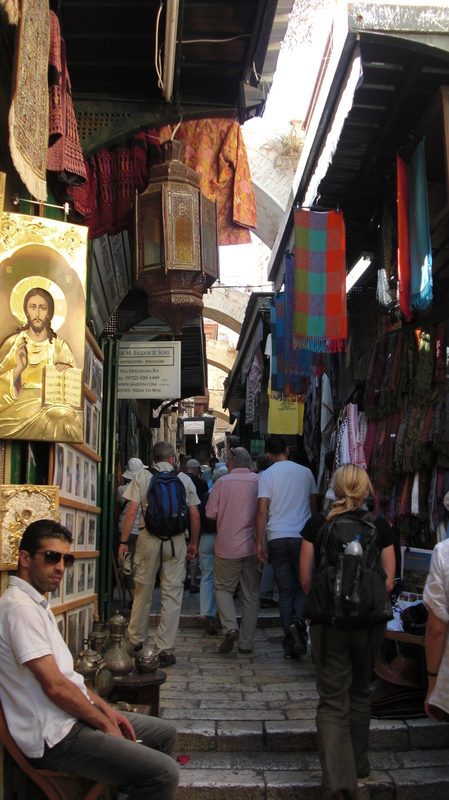 Ann walked up the Via Dolorosa, among a medley of nations and faiths going about their spiritual business. With deadpan faces, vendors shamelessly extorted every penny from their customers as they offered holy relics and exotic goods. 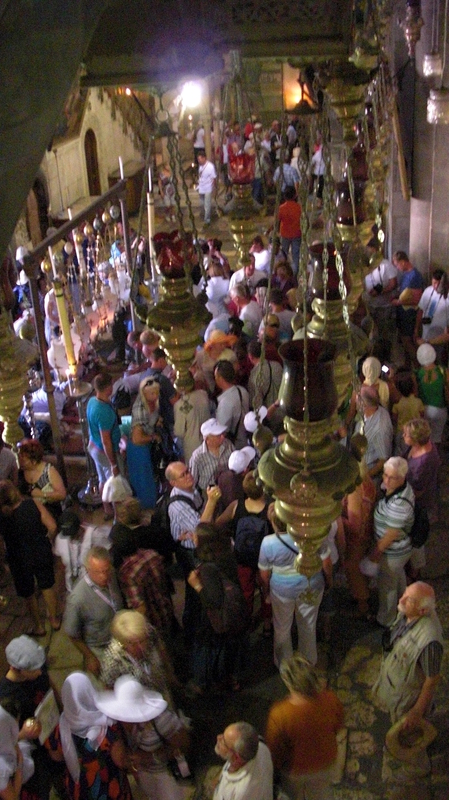 The Church of the Holy Sepulchre was a vibrant mass of people clothed in the colours of all nations. Several clergy led their groups in prayer, others watched from the side. Tour guides waving banners pushed through the throng to make way for their followers, calling in many languages over the clamour as they shouted their spiel. Winding queues of humanity waited to perform obeisance, obliterating the holiness of the surroundings through sheer force of numbers. Ann climbed to a higher level, her heart a stone as her detached gaze took in the scene, from the golden glory of the high dome to the cacophony below. What was she – a watcher? She certainly felt no desire to join the endless queues to kiss the embalming stone, or pay homage at the traditional site of the crucifixion. 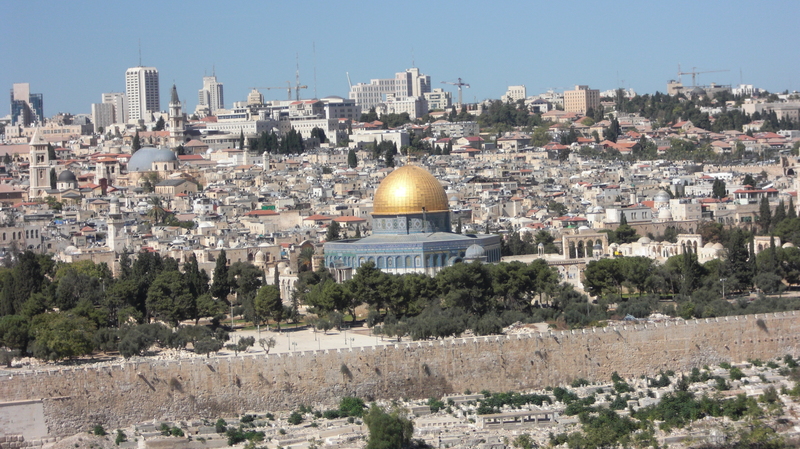 Or even to see Jesus’s traditional burial place. Her legs were aching, and there was no place to sit. Was it like this in Jesus’s day? It must have been. No wonder he wept. She turned away with a final look at the dome, and walked to a corner of the outside courtyard. She climbed up worn stone steps and emerged into a different world. A musty Coptic Church held jaded relics of grandeur, yet there was calmness, dignity and quiet reverence here. She savoured the blessed peace and dropped a coin among the meagre offerings. A woman carrying a jar of water on her head regarded her with polite curiosity. “Not many visitors come this way,” said an Ethiopian monk, who emerged from a round clay dwelling and padded up to her. He guided her through the small courtyard and Ann nodded in appreciation before allowing herself to be led through a stone passageway and back to the melee below. You can read about I Lift Up My Eyes HERE and buy it on Amazon. In fact, both of my books are on bargain sale if you BUY NOW! 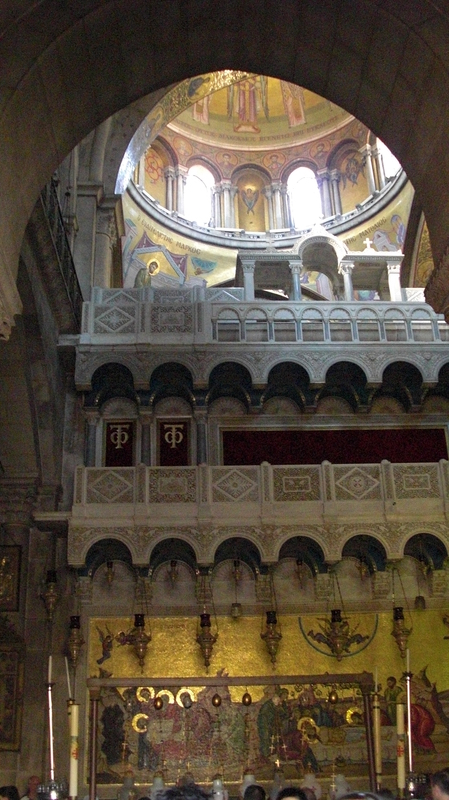 This entry was posted in I Lift Up My Eyes, Travels and tagged Church of the Holy Sepulchre, coptic church, crucifixion, embalming stone, Garden of Gethsemane, Israel, Jerusalem, Jesus. Bookmark the permalink.